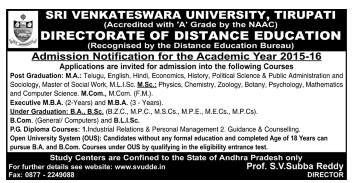 #SVU Degree,PG Courses Distance Education (DDE):Sri Venkateswara University, Directorate of Distance Education (DDE) invites applications for admission into the following Post Graduation,Under Graduation and P.G. Diploma Courses. 1. M.A: Telugu, English, Hindi, Economics, History, Political Science & Public Administration and Sociology, Master of Social Work. M.L.I.Sc. 2. M.Sc. : Physics, Chemistry, Zoology, Botany, Psychology, Mathematics and Computer Science. 4. Executive M.B.A (2- years) and M.B.A (3-years). II. Under Graduation: B.A., B.Sc (Computers, Mathematics, Statistics, Physics & Electronics, Chemistry, Botany), B.Com., B.Com (Computers), B.L.I.Sc. III. P.G. Diploma Courses: Industrial Relations & Personal Management and Guidance & Counselling. IV. Open University System (OUS): Candidates without any formal qualification can pursue B.A and B.Com courses under OUS by qualifying in the eligibility entrance test. How to Apply: Filled in applications shall be submitted to The Director, Directorate of Distance Education, S.V University, Tirupati by registered post or in person. Last date for submission of filled in application without fine: 29.02.2016. Last date for submission of filled in application with fine of Rs. 200: 31.03.2016. Last date for submission of filled in application with fine of Rs. 500: 09.05.2016. Open University System (BACET) online Registration Starts from: 16.12.2015. Last Date for Submission of filled in Applications: 31.03.2016. Date of Entrance Examination (BACET): 10.04.2016.